I have written previously about the Roman Catholic Ressourcement as well as the related monastic ressourcement present in the publications of Cistercian Press. There is also transpiring in these transitional days from ‘modern’ to ‘whatever comes next’ (postmodern or hypermodern or post-postmodern or what-have-you) an evangelical ressourcement. I am particularly interested in the evangelical ressourcement as someone who worships with the Free Church of Scotland (at a congregation that lists ‘Evangelical’ on its sign) who grew up in the charismatic, evangelical wing of the Anglican Church (complete with weekly Eucharist, beefy sermons, renewal meetings, youth camps, contemporary worship, classic hymns, and the Alpha Course) and who has a long association with Inter-Varsity Christian Fellowship (including one year of actual employment by said organisation). This particular manifestation of ressourcement tends to say that the theological heritage of at least the first five centuries of Christianity — if not the period ending with the death of Bede (+735) or of John of Damascus (+749) — is the common heritage of all Christians, and not just of the Eastern Orthodox or Roman Catholics. As Protestants, we believe in the Most Holy Trinity, the two natures of Christ, the authority of the Scriptures for life and doctrine, the centrality of Christ’s death and resurrection for human history, and other important doctrines — all of which were forged and formulated in the Patristic age. I first encountered this ressourcement through the ‘paleo-orthodox’ camp that strives to revitalise the mainline through a return to the Fathers as well as the historic practices of prayer and worship found in the church’s tradition. 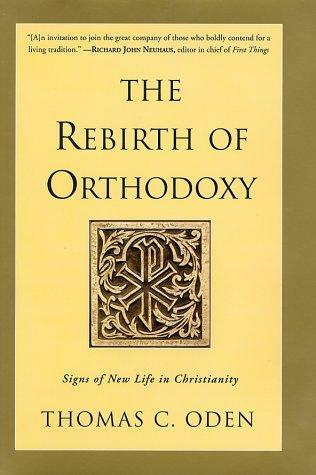 The term was coined by Thomas C. Oden, and his paleo-orthodox vision is set out in his book The Rebirth of Orthodoxy: Signs of New Life in Christianity. In this book he calls mainline Protestants to rediscover the riches of the Patristic theological legacy and heritage common to all believers; he believes that only thus will we see a blooming of orthodox theology in mainline Protestant churches. Around the time I read that book, I also read Ancient and Postmodern Christianity: Paleo-Orthodoxy in the 21st Century, a collection of essays in honour of Thomas C. Oden, one of which started to revolutionise my thinking, although now that I’m a (sort-of) scholar I (of course) take issue with the author’s representation of Pope Leo I’s Christology. I also went in search of evidence that I was not alone. Through Googling ‘paleo-orthodoxy’, I came across the blog Gloria Deo: Wesleyanglican ramblings. There you can read the musings of a United Methodist minister who is seeking to live faithfully the tradition that has been handed down to us through the Fathers, the Anglican tradition, and the tradition that grew out of Anglicanism via the Wesley brothers. From him, I found the Post-Evangelical wilderness of the late Michael Spencer, the Internet Monk, who is well-worth a read if you find yourself feeling a bit ‘Post-Evangelical’ and searching where to find land, air, and drinkable water. The term ressourcement I first found in the IVP volume collecting conference contributions Ancient Faith for the Church’s Future, a collection of essays that seek to find wisdom in the Fathers to apply to today’s situation, seeking to help us escape from some of the wanderings and traps of this age. It is encouraging to see evangelical leaders seeking to find timeless wisdom in ancient texts. As a Classicist, I think this is a most sensible action! IVP, under the watchful eye of Tom Oden, has produced probably one of the biggest aids to the Evangelical ressourcement, and that is the Ancient Christian Commentary on Scripture. Consisting of 29 volumes, two of which cover the OT apocrypha, it is essentially a patristic catena on the whole Bible — that late-ancient and mediaeval form of Bible commentary where a series of short musings from the Fathers is arranged following the pertinent passage of Scripture. Now it is easy for pastors, Bible study leaders, as well as the average Christian with the money or access to a good theological library, to find out a lot (Oden would argue the mainstream) of patristic exegesis and thought on Scripture. This series has companion volumes for this with smaller wallets and less ambitious designs — the Ancient Christian Devotional series. This is a three-volume set that gives the thoughts on the Fathers following the lectionary readings for years A, B, and C in the Revised Common Lectionary as well as two ancient/early mediaeval prayers for each week. I have used that for Year C and I quite liked it! I am using Year B right now, and it is also good, although sometimes I fail to see how the patristic commentary lines up with the passage at hand. A few more things from IVP related to the Ancient Christian Commentary: Ancient Christian Doctrine and Ancient Christian Texts. The former is a five-volume series covering mainstream patristic thought on major doctrines of the Faith; the volumes are We Believe in One God, We Believe in One Lord Jesus Christ, We Believe in the Crucified and Risen Lord, We Believe in the Holy Spirit, and We Believe in One Holy Catholic and Apostolic Church. 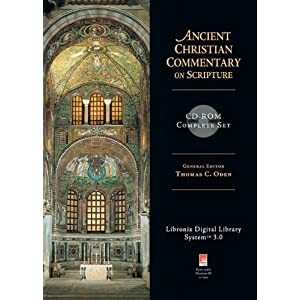 The Ancient Christian Texts series makes available entire patristic commentaries, with a focus upon texts as yet untranslated into English, although I would argue that some texts, such as John Chrysostom on Romans, are due for a re-translation! IVP has also published three volumes by Christopher A Hall about the Fathers: Reading Scripture with the Church Fathers, Learning Theology with the Church Fathers (my review here), and Worshiping with the Church Fathers. These three together make an excellent popular-level introduction to the world of the Church Fathers. Not that IVP is alone or even necessarily the frontrunner in the Evangelical ressourcement — these are merely those texts I am best acquainted with. Baker Academic has a series called Evangelical Ressourcement, and I am currently reading a sourcebook by DH Williams of patristic passages called Scripture, Tradition, and Interpretation. Williams also has the volume of that series called Evangelicals and Tradition, and I am reading his book Retrieving the Tradition & Renewing Evangelicalism as well. Whereas Oden is a United Methodist and Hall an Anglican, Williams is a Baptist, and is thus a very welcome voice in the midst of Evangelicals calling for a return to the theology and thought-world of the first five centuries of Christianity. There is also Robert E. Webber’s Ancient-Future movement, and I know from glancing through iMonk’s commenters that many people have found his book Ancient-Future Worship very helpful in their walk as they find contemporary expressions of evangelical faith hard to deal with. I quite enjoyed Ancient-Future Faith as well, and hope that many will read that text which is inspired by Irenaeus of Lyons and seeks to bring Christus Victor into evangelical theology alongside (not instead of) more traditional western atonement theology as well as turning Cyril of Jerusalem for catechetical ideas. I would include The Church’s Bible (reviewed by First Things here), akin to IVP’s Ancient Christian Commentary but including longer passages and incorporating mediaeval commentary as well, but Robert Louis Wilken is now a Roman Catholic — I guess his project falls under the Catholic ressourcement instead! Yet it is still welcome and will no doubt be of great use to evangelical readers. I have previously posted about the fourfold sense of Scripture here and here. Among the spiritual senses, we find typology. Typology, as you may recall, is when we see events, items, and persons in the Old Testament as prefigurations of New Testament theology. It is distinguished from allegory as allegory is when we see parallels in events in the Old Testament not only of the New Testament but also of our own spiritual journey. Thus, an allegorical reading of Genesis 3, while not denying the real Fall of humanity, will say that this is the story of Everyman. Typology, on other hand, sees a moment as a single flash of the greatness of the fulfillment of the promises in Christ and the Church — Melchizedek is a type of Christ; the flashing sword in Eden is a type of Mary; the crossing of the Red Sea is a type of Baptism, Jerusalem is a type of the heavenly city, and so forth. I have already posted on Noah’s Ark as a type of Mary. This approach to Scripture is never meant to entirely supplant the literal or historical meaning, something even its most famous proponent, Origen, acknowledges. Yet it seeks to see with spiritual eyes a new, different layer of meaning. Since the purpose of Scripture is to reveal to us the things of God and empower us to lead godly lives, I see no difficulty in this way of reading Scripture. Suddenly, Scripture is not limited to a single, literal meaning at every turn of the page. Through prayerful consideration and the reading of other spiritual books, the Holy Spirit can guide us to spiritual truths about ourselves and the Gospels that perhaps we would never have thought of if shackled to the liberal/fundamentalist approach. If we remind ourselves that our doctrine of the Trinity is smaller than the Trinity, that our Christology is a feeble attempt to encapsulate in words the wonders of God Incarnate, if we keep in mind the smallness of ourselves and our doctrines about God in the Face of God Himself, then typology and its difficulties make a certain sense — God is ultimately incomprehensible and a great mystery. Ought not His self-revelation to the world to be filled with wonder and beauty? The Orthodox Study Bible. The NT of this study Bible has been out for a long time, and a couple of years ago they released the entire Bible, Septuagint and NT. Its footnotes provide us with a primarily typological reading of the OT, so it can stand alongside most Protestant study Bibles that give us the literal account and thus bring us deeper into the spiritual world of the Word. The Ancient Christian Commentary on Scripture. This series of commentaries gathers together selections from the Fathers on the entirety of Scripture. A great many, though not all, patristic passages herein provide a typological understanding of the Scriptural passage at hand. Ephrem the Syrian, referenced by Brock in the second passage above, has a number of works translated at the CCEL; there is also a volume in the Classics of Western Spirituality Series from Paulist Press and another of the Hymns on Paradise in the Popular Patristics Series from SVS Press. His hymns on the incarnation are especially beautiful, as I’ve noted on this blog before; he takes your mind in worship to places it has likely never gone before. Gregory of Nyssa’s Life of Moses, mentioned here before, is worth a read, combining both the allegorical and typological readings of Scripture after giving the straight historical reading of the text. The same translation exists in the Classics of Western Spirituality series as well as in the HarperCollins Spiritual Classics; the latter has a less extensive introduction but is also cheaper. Origen of Alexandria is the most famous of the exegetes who apply “spiritual” methods to Scripture. His Commentary on the Gospel of John provides an introduction to his method of reading Scripture. I’m still working on Origen, myself, so I do not know what else of his to recommend. Hall, Christopher A. Reading Scripture with the Church Fathers. This book deals with the Four Doctors of the Western and the Four Doctors of the Eastern Church and how they read Scripture, including space devoted to Origen and Diodore of Tarsus. Space is thus given to the more spiritual readings of Scripture that lead us to typological understandings. This is a popular level book, geared towards pastors and students. de Lubac, Henri. Medieval Exegesis: The Fourfold Sense of Scripture. This monumental work, a product of the Ressourcement that began in the 1950s (not ’20s, sorry), taking up three volumes in English, will give you all you want to know about Patristic and western Mediaeval approaches to the reading and interpretation of Scripture. This is a work of scholarship, but the rewards are no doubt hefty for those who persevere to the end (I have yet to do so). *S. Brock, “Mary in the Syriac Tradition,” in Mary’s Place in Christian Dialogue, ed. Alberic Stacpoole. Pp. 182-191. In “This Week in Patristics” for May 30 – June 4, Phil Snider ponders, “It does make me wonder what the next step is, now that we have so many competant introductions.” This is a good question. I, myself, have read a few good introductions of various types, such as Thomas C. Oden’s The Rebirth of Orthodoxy which is a call for mainline Protestants to rediscover the Church Fathers, Christopher A. Hall’s three volumes from IVP, Robert E. Webber’s Ancient-Future Faith, and Boniface Ramsey’s Beginning to Read the Fathers. One answer, of course (and I’m pretty sure Phil thought of this), is to read more and more of the Fathers. The Age of the Fathers contains an enormous volume of content, much of which is worth reading more than once, spanning the Mediterranean world and beyond, covering a multitude of genres both prose and poetic, and providing wisdom for many different aspects of our lives. If the bigness of the Patristic world overwhelms you, I recommend working through something like Ramsey’s “Patristic Reading Program” as at the back of Beginning to Read the Fathers. I also recommend, if you’ve read a lot about the Fathers but not much from the Fathers, that you get Henry Chadwick’s translation of St. Augustine’s Confessions, the SVS translation of St. Athanasius’ On the Incarnation, and the Penguin Classics edition, by Maxwell Staniforth and Andrew Louth, of the Apostolic Fathers called Early Christian Writings. These will give you a variety of different writings from East and West in different genres. You can move on from there based on what you found of interest. If you are already reading the Fathers but are looking for guides, a good idea is to get a book of essays on Patristic themes. One of my first introductions to the secondary material on the Church Fathers was Ancient and Postmodern Christianity: Paleo-orthodoxy in the 21st Century, ed. Kenneth Tanner and Christopher A. Hall, a collection of essays about patristic themes and the question of orthodoxy in today’s Church. A similar volume, also from IVP, was Ancient Faith for the Church’s Future, a collection of conference papers on Patristic questions and their application to today’s situations. Another, similar, idea is to find authors of series of books on Patristic questions, such as Robert E. Webber’s series that began with Ancient-Future Faith but also includes Ancient-Future Evangelism and Ancient-Future Worship. These books tend to point you towards others, both primary material and secondary sources, that may interest you. I have a friend who is a missionary in Cyprus, and because St. John Chrysostom is such a big deal in the Greek Orthodox world, he got his hands on J.N.D. Kelly’s book Goldenmouth. If you are a Jerome enthusiast, Kelly also has Jerome. Along similar lines to a modern biography/study of an ancient Christian figure is the Routledge series The Early Church Fathers. Who has caught your eye, but the bibliography seems too big? St. Leo? No problem! Or Severus of Antioch? Or Evagrius Ponticus? Or Ambrose of Milan? Or Cyril of Alexandria? Or Athanasius? No problem! Alternatively, browse through a handbook to see what material there is. I realise that non-specialists with not a lot of time on their hands will be less excited by Daniel Hombergen’s The Second Origenist Controversy than I am, but handbooks also point you less weighty, more readable material along the way; there is Quasten’s multi-volume Patrology as well as Hubertus Drobner’s single-volume The Fathers of the Church. If a book looks like it will kill you from boredom, don’t be ashamed to put it down! The whole point of Patristics is edification and drawing nearer to Christ. We only have so many hours in our lives, so wasting time with boring or excessively long books that will profit us little is not to be recommended. Finally, why not take your daily Bible readings and the Ancient Christian Commentary on Scripture and read along that way? And if a passage is particularly striking, see if you can find it in context and find more Church Fathers and connexions that way. You will learn more about Scripture at the same time! To save time, for those who use the Revised Common Lectionary, the companion volumes Ancient Christian Devotional (Year A doesn’t specify the year, Year C is out, and I hope to see Year B by Advent) are aligned with the Lectionary. Also interesting may be Hendrickson’s Day by Day with the Early Church Fathers. This is all for now, but even if you choose a single one of these, you will have taken an important step beyond reading introduction to the Fathers after introduction! When we consider the recent weekly saints, we see a powerful evangelist in David Wilkerson, mystics in Mary, Evelyn Underhill, and John Climacus, a helper of the poor in Euphemia, and a Bible translator in Lancelot Andrewes. This week, our saint is … an historian? The Venerable St. Bede (673-735) is most famous for his Ecclesiastical History of the English People. This document is something to be rightly famous for, giving us some of our only references to persons of the life of Anglo-Saxon England, as well as documenting the lives of the bulwarks of the early English church such as Alban (saint of the week here) and Hilda (I’ve written of her here). This work is important for mediaevalists and church historians alike, including King Arthur fans (that’s how I first heard of it). But our dear friend Bede was more than a historian — not that being an historian is something at which one should turn one’s nose up. He was also a hagiographer, as we see when St. Cuthbert was saint of the week, having composed both a prose and a a verse life of St. Cuthbert. He also wrote lives of Sts. Anastasius and Felix as well as a Martyrology. Bede also wrote Bible commentaries and is the upper limit for IVP’s Ancient Christian Commentary on Scripture, covering Acts, Revelation, the Catholic Epistles, the Pauline Epistles, Ezra and Nehemiah, Genesis, the prayer of Habakkuk, Luke, Mark, Proverbs, Samuel, Song of Songs, and Tobit as well as topical commentaries on the Tabernacle and Solomon’s Temple. As well, Bede was a homilist, poet, hymnographer, letter-writer, writer of treatises on Latin metre and on scientific topics, and an editor of a Psalter for use by his fellow-monks. Bede, my friends, was a scholar. He was, of course, a scholar-monk. He lived in the Anglo-Saxon monastery at Jarrow in the Kingdom of Northumberland. He entered the monastic life at Wearmouth, also in Northumberland, at age seven. He spent his life living in one of these two monasteries, and met some interesting people amidst the many, many books he read, including Adomnán of Iona, hagiographer of St. Columba (saint of the week here). Bede does not seem to have travelled much, which is likely a common reality for most people of the pre-modern world. He visited his friend and former pupil Ecgbert at York in 733 and also visited Lindisfarne at some point as well as a couple of monasteries. Bede left much to posterity, even if much of it is rarely read by his descendants here in Britain. Nonetheless, his life is a testament to what God can produce in someone with a keen mind and diligent work. Huzzah for Bede and prolific scholars everywhere! May they continue to enlighten the world! I think that the Feast of the Annunciation of the BVM is one of those feasts that a lot of low(er) Protestants avoid because BVM = Blessed Virgin Mary = obvious Papist connexions. This is silly. The Annunciation is the first feast of the earthly life of Christ. 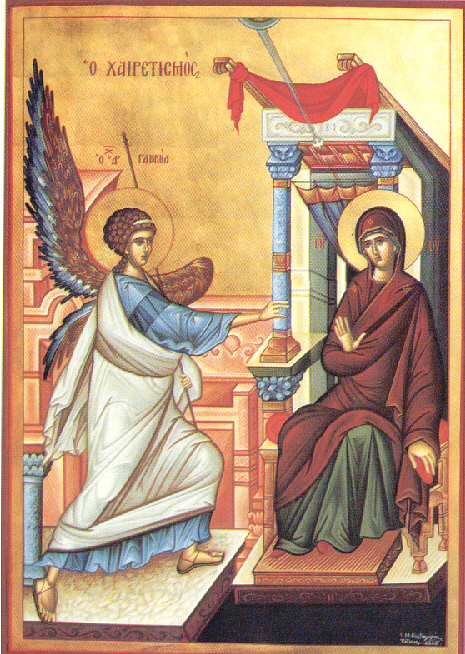 Furthermore, unlike, say, the Dormition (Assumption), the Annunciation is a biblical event. And we all know how much we Protestants love the Bible! This Feast is on March 25, and I celebrated it by popping in at my local Orthodox Church and standing around through the Divine Liturgy (Eucharist). Not that I could receive the Sacrament, but it was good to be there. The dove foreshadowed the Holy Spirit (Mt 3:10), who caused the Holy Virgin to conceive Christ in her womb, and the olive leaf speaks of the Virgin herself (Lk 1:35, Akath). That abbrev. ‘Akath’ = Akathist Hymn. The Service of the Akathist Hymn is a beautiful service of the Orthodox Church that takes place over the first five Fridays of Lent, the full Service occurring on the final; the hymn itself was possibly composed by Romanos the Melodist in the sixth century. It is a hymn all about the Theotokos (Mother of God, see here for why that’s an important title). Anyway, I noticed neither during the service nor later when I read through the Akathist hymn myself this particular piece of typology (on the fourfold sense of Scripture, read here). It was not, however, the first piece of typology I thought of. In Noah’s Ark, as all good Sunday School children know, were the entire human race and all the living animals as well. In the belly of the ark (fun fact: the Greek for belly and hold are similar). These humans and animals were saved from destruction in the terrible Flood by taking refuge in the Ark. The typology I thought of was that the BVM is like the Ark because she carried the salvation of the world in her belly as well — she carried our Lord Christ, God Incarnate, without Whom we would all be lost, inside her womb. The Annunciation, celebrated nine months before Christmas, is the starting day of our salvation, as the priest noted to us in his homily that day. The Orthodox Study Bible confirms this, citing once again the Akathist Hymn. It, however, was not my first place to turn but my second. My first place to turn was the IVP Ancient Christian Commentary on Scripture, and there I found only typologies for the Ark as the Church, wherein the human race is saved. This typology also works. Nonetheless, I like this old, forgotten way of reading the Bible. While I’ll never abandon the historical method, to have this more spiritual approach alongside adds greater depth to my reading. The Ark is the BVM. Cool.